Plant a tree in memory of Elnora "Norie"
Be the first to share your favorite memory, photo or story of Elnora "Norie". This memorial page is dedicated for family, friends and future generations to celebrate the life of their loved one. 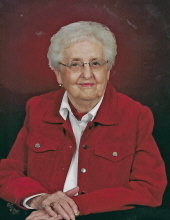 Elnora “Norie” Grace Fett, the daughter of Charles and Elsie (Blunt) Duvall, was born October 10, 1920, at her parents’ home in Melville Township Audubon County, Iowa and died January 23, 2019, at the Friendship Home in Audubon, Iowa at the age of 98 years, 3 months, and 13 days. Elnora was baptized and confirmed as an adult on October 6, 1940, at Our Saviour’s Lutheran Church in Audubon, Iowa. She attended rural school in Melville Township then studied at the Viola High School where she enjoyed playing basketball and graduated with the Class of 1938. On April 9, 1939, she was united in marriage to Kenneth Orville Fett at St. John’s Lutheran Church in rural Adair, Iowa. They were blessed with four sons Roger Lee, Arnold Kenneth, Marcel James, and Russell Paul. They lived on Kenneth’s family farm in Guthrie County where they grew row crops and raised livestock. Elnora help Kenneth operate the farm, raise the boys, and always had a large garden. They retired in 1984 and moved into Audubon. Elnora was a member of Our Saviour’s Lutheran Church in Audubon. She was an excellent cook, enjoyed crocheting, reading, playing cards, golf, and spending time with her family and neighbors. Preceding her in death was her husband Kenneth O. Fett; her son Roger Fett; her parents; her sister Ethel Duvall; and her brothers Edwin and wife Wilma Duvall and Earl and wife Esther Duvall. Survivors include her sons Arnold and wife Linda Fett of Hudson, Wisconsin, Marcel and wife Connie Fett of Audubon, Iowa, and Russell and wife Cindy Fett of Poway, California; her daughter-in-law Sharolyn Fett of Guthrie Center, Iowa; her 11 grandchildren Pamela (Brian) Brodd of Fremont, Nebraska, Brian (David) Fett-Jones of Elkhorn, Nebraska, Shari Fett of Ankeny, Iowa, Becky (Anibal) Velarde of Lonsdale, Minnesota, Chad (Heidi) Fett of Hudson, Wisconsin, Cortney Hauschildt of Hartford, Iowa, Jill Hermansen of Audubon, Iowa, Jason (Andrea) Fett of Guthrie Center, Iowa, Jodi (Matt) Schweiger of Adel, Iowa, Andrea (Scott) Tatum of Escondido, California and Emily Fett of Portland, Oregon; her 24 great grandchildren Kristen (Nate) Mishou, Curtis and Kenan Brodd, elijah and caden fett-jones, Lucas, Isaiah, Josiah, and Olivia Velarde, Abigail, Isabella, and Gracelyn Fett, Alexis and Jake Hauschildt, Eric, Aleah, and Ryan Hermansen, Nicholas, Mathew(Anna) and Jared Fett, Wyatt and Will Schweiger, Paytn and Joe Schramm; many nieces, nephews, other relatives and many friends. The family will meet with friends on Friday evening, February 1, 2019, at 5:00 p.m. at the Kessler Funeral Home in Audubon, Iowa. Funeral service will be conducted by Pastor Ben Unseth on Saturday February 2, 2019, at 10:30 a.m. at Our Saviour’s Lutheran Church in Audubon. Interment will be in the Maple Grove Cemetery in Audubon. The casket bearers will be great grandsons Curtis Brodd, Kenan Brodd, Jake Hauschildt, Isaiah Velarde, Jared Fett, elijah fett-jones and grand son-in-law Scott Tatum. The family prefers gifts in memoriam to The Friendship Home in Audubon and Our Saviour’s Lutheran Church in Audubon. To plant a tree in memory of Elnora "Norie" Grace Fett, please visit our Tribute Store. "Email Address" would like to share the life celebration of Elnora "Norie" Grace Fett. Click on the "link" to go to share a favorite memory or leave a condolence message for the family.